As you can see it’s summer here in San Francisco. Standing on my roof in the fog often feels like I’m standing at the edge of the world, and given my proximity to the Pacific, and San Francisco being one of the more westerly oases for the spiritually and culturally exiled, I suppose I am standing on such a precipice. This shot in particular looks like I was waiting for a bus and suddenly found myself teleported to the rooftop. Here I’m clad in my de rigueur rumpled shirt and trousers, with my concave torso at least being disguised in several layers of fabric. The lack of a pocket square is because I fled the house in some haste – tardy, as usual, for what some call work. 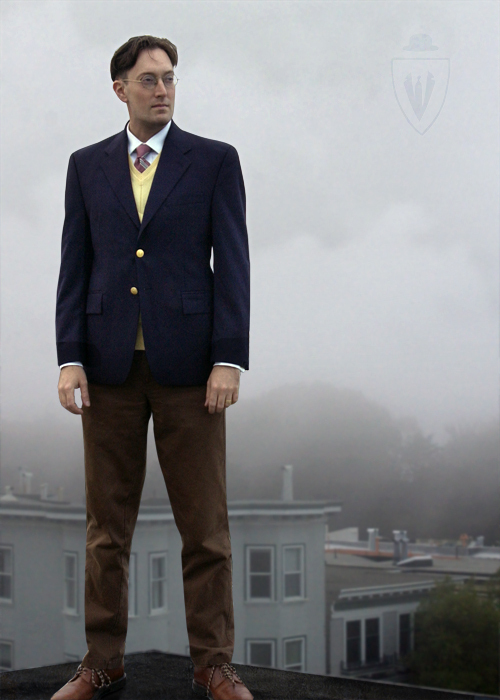 The jacket is from the discontinued Polo “University” label; although that bridge line is no longer, there are currently others to choose from. My preference is Rugby – a favorite of Polo’s attempt at “gateway drugs,” though perhaps that isn’t being quite fair to Rugby, which was once the more daring child of Papa Ralph’s. But, ultimately, it is the accountants who control our blue chip consumer goods, not the creatives, so I don’t (usually) blame designers for any lulls. 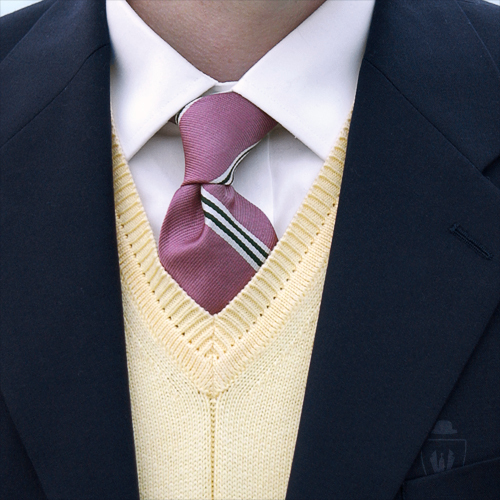 Ahem, back to me – the sweater vest is Façonnable. I confess some surprise that the fit wasn’t more of a “slim”, you know — with their famous Mediterranean diet and all. Though, with my creeping decrepitude, leaving room to grow probably isn’t a bad thing. The shirt is Cafe Coton and the tie is American Traditions. The latter’s name is open to some interpretation, invoking either “witch trials” or, more probably, “WASPs.” (Both Cotton Mather and Thomas Paine can be perceived as American heroes depending which American you ask.) American Traditions, at least at the time of this particular tie’s birth, was owned/licensed by Superba Inc, a subsidiary of Phillips-Van Heusen Inc, who own nearly every brand you’ve ever bought at a mall. Ah yes, the “comglom,” or in slang: “if an oligarch was transposed into a spreadsheet.” Of course, as Citizens United v. FEC showed us, there is no difference anyway.